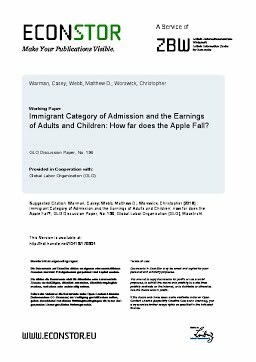 MacOdrum Library - Carleton's Institutional Repository: Immigrant category of admission and the earnings of adults and children: how far does the apple fall? Immigrant category of admission and the earnings of adults and children: how far does the apple fall? Immigrants in many Western countries have experienced poor economic outcomes. This has led to a lack of integration of child immigrants (the 1.5 generation) and the second generation in some countries. However, in Canada, child immigrants and the second generation have on average integrated very well economically. We examine the importance of Canada’s admission classes to determine if there is an earnings benefit of the selection under the economic classes to (1) the Adult Arrival immigrants and (2) the Child Arrival immigrants (1.5 generation) once old enough to enter the labour market. We employ unique administrative data on landing records matched with subsequent income tax records that also allows for the linking of the records of Adult Arrival parents and their Child Arrival children. We find, relative to the Family Class, the Adult Arrivals in the Skilled Worker category have earnings that are 29% higher for men and 38% higher for women. These differences persist even after controlling for detailed personal characteristics such as education and language fluency at 21% for men and 27% for women. Child Arrival immigrants landing in the Skilled Worker Class have earnings advantages (as adults) over their Family Class counterparts of 17% for men and 21% for women. These Child Arrival Skilled Worker advantages remain at 9% for men and 14% for women after controlling for child characteristics, the Principal Applicant parent’s characteristics, and the parent’s subsequent income in Canada.